Here is a list of our annual challenge books. Click the book covers to view and purchase the books. 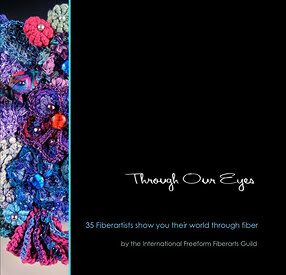 run by The International Freeform Fiberart Guild. produce, and exhibit our annual fiberart show. and this is our challenge theme for 2017. 32 of our members took up the challenge and created a work of fiberart. Many forms of flora and fauna are represented here. This book is dedicated to Mel Gill who passed away in April 2016. 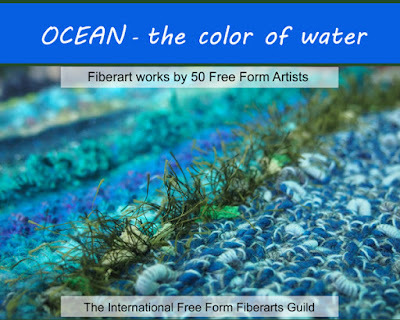 In 2015, members of the International Freeform Fiberarts Guild were given the theme Ocean/the Color of Water for the Annual Challenge. 50 artists participated, including 13 first timers, interpreting the theme as it inspired them. The range of art created matches the depth of the theme. They were encouraged to share their inspiration as well as the actual artwork. None of the artists saw any of the other's work until the online gallery went live. 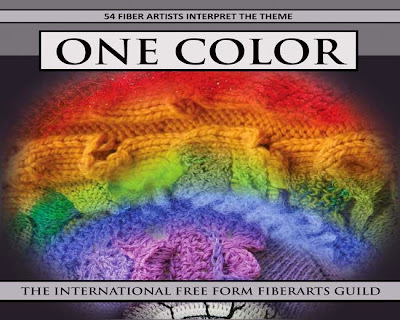 54 fiber artists, from the International Free Form Fiberarts Guild, have interpreted the 2014 Annual Challenge theme of ONE COLOR. Each artist has a story to tell you, and they tell it in color. How they reached their goal is a tale of inspiration, struggle, challenge, and fun, and the final show is intoxicating. 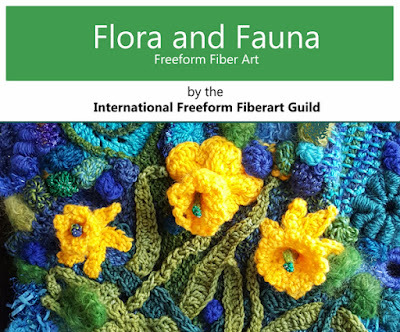 The Free Form Fiberarts Guild Challenge is open to all of its members, and welcomes and encourages all skill levels to participate. Knitting and/or crochet are asked for in the guidelines of the Challenge, and the rest is up to the individual artists. Weaving, beading, felting, embroidery, tatting, dyeing, painting, wirework, glass lampwork, fused glass, wood, plastic, ceramics, fabric, lace, ribbons, cords, braids, buttons, stones, shells, and even feathers have been included in these various fiberarts. Be prepared for a surprise or two as you look closer at the fiberart pieces in this book. 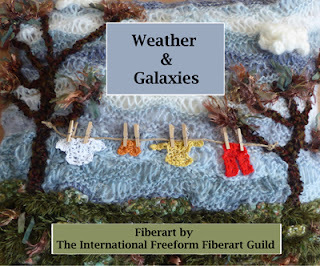 Every year, the International Freeform Fiberarts Guild votes on a theme for the annual challenge. Work begins officially on January 1 and continues for several months. Pictures are submitted online and assembled into both an online gallery and a hardcopy book available for purchase. Every year, the artists who make up this wonderful online community surpass themselves with amazing works of art. 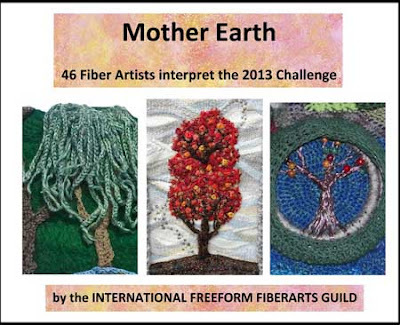 The theme for our 2013 Freeform Challenge is Mother Earth. Each of the 46 participants interpreted the theme personally and the results are, once again, wonderful. 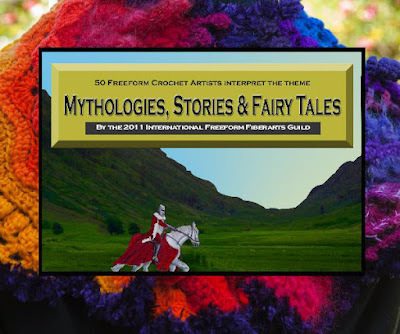 The 2011 International Freeform Fiberarts Guild presents "Mythologies, Stories & Fairy Tales"
50 Freeform fiber artists from all around the globe participated in the theme for 2011. The artists were given the opportunity to create one freeform fiberart piece interpreting the theme in any way they choose, and using any materials for their fiberart and any techniques they would like to incorporate into the artwork. Many of the pieces are wearable art, sculptural, and decorative pieces. Most included embellishments, 3-D work, and textural details. All are unique works of art. Be inspired. 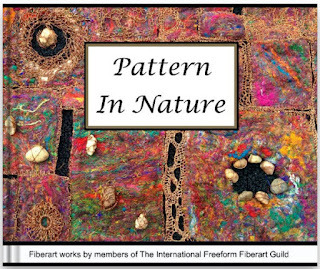 The 2010 International Freeform Fiberarts Guild show, "Somewhere in My World", includes 61 freeform fiber artists from all around the globe. The artists were given the choice of creating one freeform piece interpreting the theme any way they chose using any materials and any techniques. The artists were not restricted to scrumbles and many of the pieces are wearable art and sculptural as well. None of the artists saw each other's pieces until the online show was published. 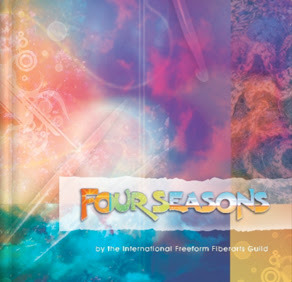 52 fiber artists from around the world are proud to present their interpretations of the Four Seasons. Members of the International Freeform Fiberarts Guild were invited to join a challenge for the 2008 annual freeform fiberart show. Their challenge was to interpret the theme, "Through Your Eyes" in any medium and needlework technique they preferred. 35 artists from across the globe rose to the challenge and created fiber art beyond description. Along with their entries, each was asked to write a short piece about what inspired them. Enjoy the journey through our eyes. 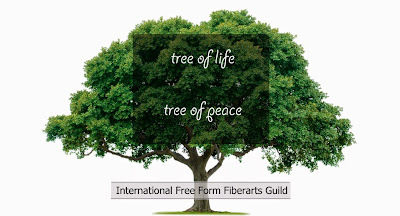 Tree of Life/Tree of Peace is the result of a project that includes freeform fiber artists from around the globe who belong to the International Freeform Artists Guild. The artists were given the choice of creating one or more three dimensional freeform pieces interpreting the theme. None of the artists saw each other's pieces until this show. Most importantly, each piece includes a gold thread as a symbol of our unity and the common thread that runs through all fiber artists past, present and future. 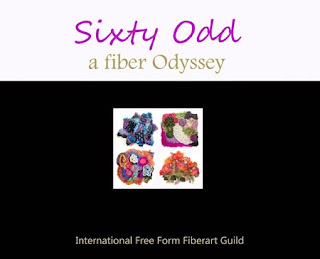 Sixty Odd/ a Fiber Odyssey is the result of a project that includes fiber artists from around the globe. Each artist started out by selecting their favorite yarn and sent in 61 five yard bundles. In return all received 61 different, five yard skeins of luscious fibers, as diverse as the members themselves. The challenge was to use the yarns in an 8 inch by 8 inch scrumble. Of the 61 original participants who sent yarn, all but 4 sent in finished work. As you will see, some members chose to select only some of the yarns and some used all of the yarns so each person’s voice is uniquely expressed through the choices they made but there is a common thread running throughout. Just like any great symphony, 60/Odd is about the blend of the entire exhibit. Each note alone is, indeed, beautiful but the harmonic of the show as a whole is its own special song, and like any fine recipe, we invite you to look at each page and savor the flavors that go into this delicious offering.